SOUTH BUFFALO (March 3, 2002) - Rick Streeter and Pat Leone battled fiercely and prevented a powerful contingent from Edinboro University from sweeping all the top spots. Streeter, with a burst of speed, managed to shake the gutsy Leone on the final straight to win in 24:39. 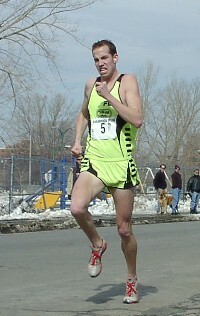 Pat Leone was 2nd in 24:43. Edinboro did not disappoint. Led by Yi Min Wu with a 25:12 clocking Edinboro took the next 3 spots and placed 5 in the top ten. Edinboro's Lisa Petsche won the womens race in 28:46 and her teammate Jocelyn Smith was second in 29:44. East Aurora's Peggy Melonic was 3rd among the women and the 1st local female runner to cross the finish line in 30:06. The Buffalo Police keep a watchful eye on thousands of runners as they approach the Ohio Street bridge.